From swoon-worthy holiday pics to thought provoking views, hotels with Infinity pools can make a holiday ever more glamorous. Infinity pools give the visual effect of an edgeless pool with water extending over the horizon, seamlessly combining landscape and pool. It has been claimed the concept originated in France in 17th century at the Palace of Versailles’ Stag Fountain but inspiration is also claimed to have originated from Bali and its terraced rice paddies. It has since been made popular by the world’s finest hotels and even featured in the James Bond movie ‘Diamonds are Forever’, making these pools ever more synonymous with luxury. An infinity pool is: “a swimming pool whose positioning gives the impression that it merges in to the surrounding landscape”. The edges where water flows, provide the visual effect that the pool has no edge. One of the most luxurious hotels on the Amalfi Coast, Belmond Hotel Caruso, since its opening in 1893, has housed many an esteemed guest. Exquisite and sumptuous, the hotel has the added benefit of spectacular clifftop views of the dramatic coastline below. The hotel’s show stopping infinity pool is an architectural masterpiece, effortlessly merging sea and sky. Swim up to the edge and gaze upon the remarkable coast as if you were suspended in the clouds. 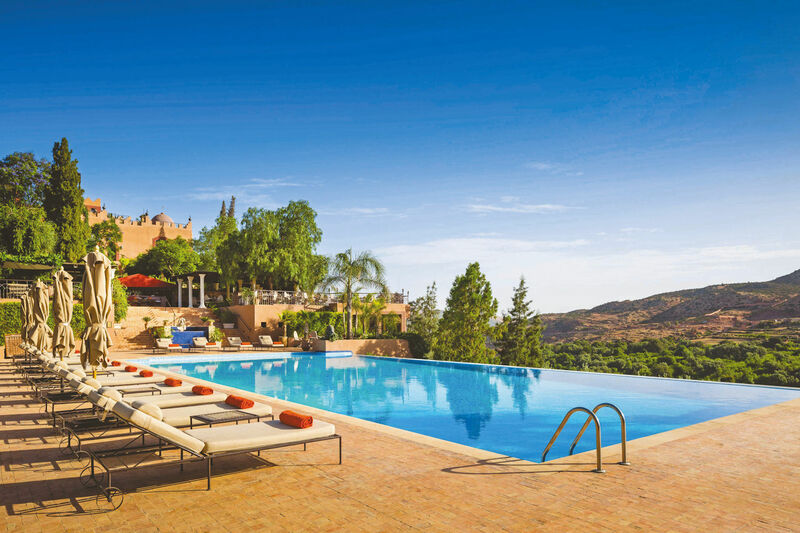 Hidden away in Morocco’s Atlas Mountains is Sir Richard Branson’s magical mountain retreat, Kasbah Tamadot. The reason the infinity pool here is so special, is the phenomenal surroundings and mountainous backdrop. The fresh and rejuvenating air that surrounds is said to have healing qualities and makes a swim here exceptionally relaxing. The hotel’s supremely luxurious Berber tented suites have attracted guests looking to experience Berber culture in a unique and luxurious way. Quite possibly the most beautiful guest rooms in the Caribbean, suites at Jade Mountain have just 3 walls and extravagant private infinity pools. The hotel itself is a romantic retreat rising high above the forest and sea below. 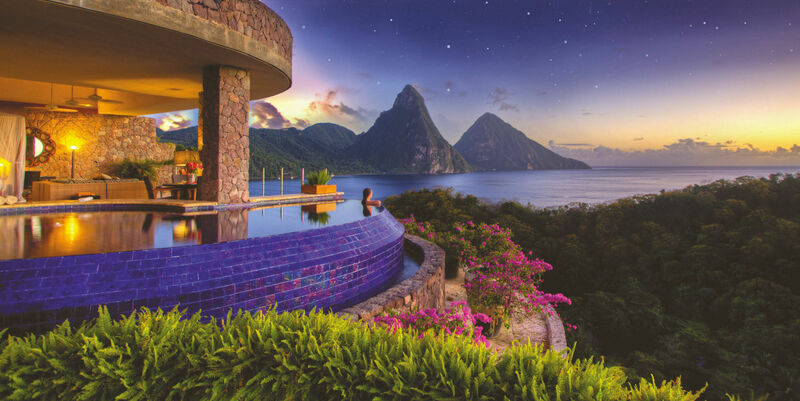 There is no more of a ‘pinch-me-moment’ here than when at the edge of your own infinity pool gazing over the enchanting Piton Mountains, surrounding Caribbean landscape and the twinkling stars above. The Greek island of Santorini is world famous for its spectacular sunsets and impressive volcanic caldera. 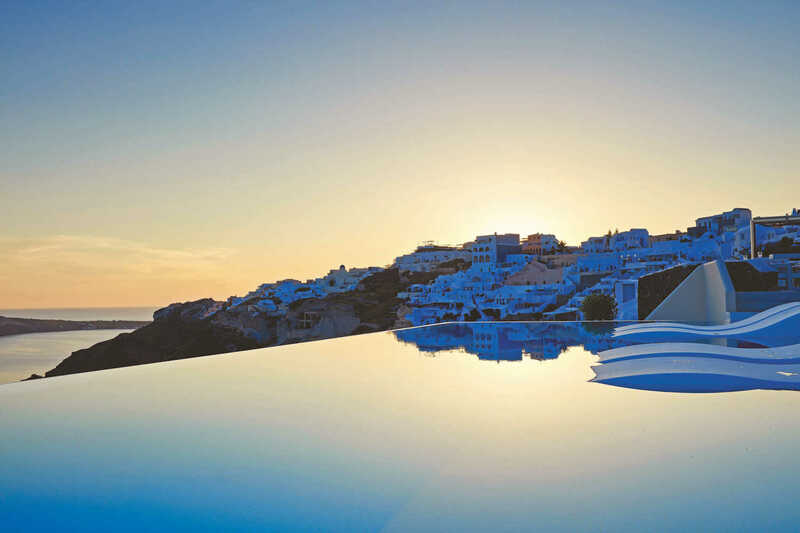 Cascading down a hillside in Oia, the adults only Canaves Oia Suites is gently perched with its stylish infinity pool. Although small, this pool is no less mighty; floating above the caldera below, this pool offers views of the sparkling Aegean waters and famous Santorini sunsets. For ultimate luxury, some of the suites here have their own private infinity pool so you can keep the views all to yourself. 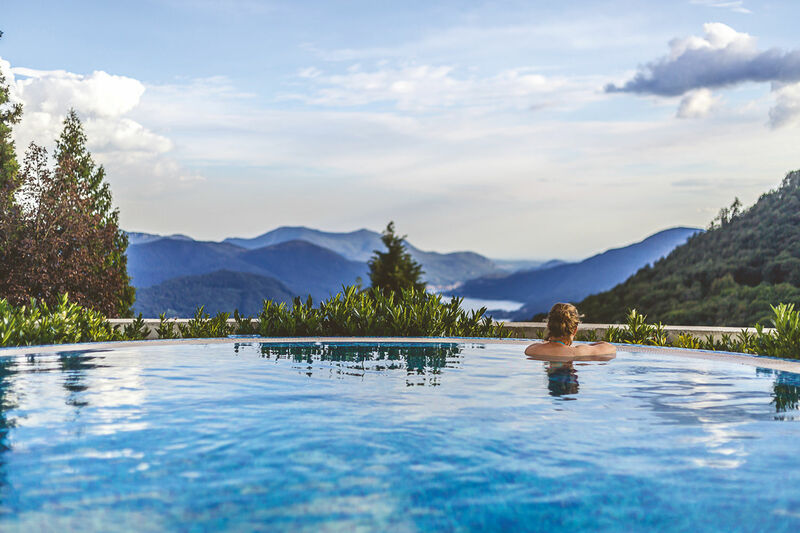 Infinity pools don’t always need sea views; Belmond Castello Di Casole in Italy’s Tuscan countryside is the perfect spot to marvel upon rolling green hills, patterned with a myriad of nature’s colours. The hotel itself is set on one of Italy’s largest private estates dating back to the 10th century. The grounds offer plenty to explore, by foot and by bike, as well as a sumptuous spa. Cooking classes, art classes, truffle walks and first class service only add to the allure of this charming countryside retreat. The Blue Palace Resort certainly love their pools with the majority of guest rooms having private infinity pools. 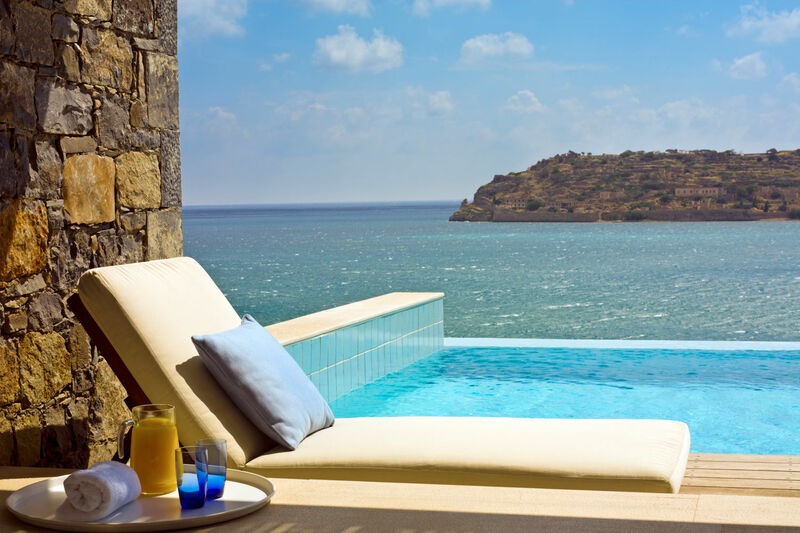 Each of which looks over the sea and the fascinating island of Spinalonga, which was once a leper colony, famously dramatized in Victoria Hislop’s novel ‘The Island’. Designed to cascade down the hillside, all rooms here overlook the sea – uninterrupted. There is no more memorable wake up than a dip straight in your own pool as the sun rises above the horizon beyond. Breathtaking views over Lake Garda await… as well as silence, serenity and eco sustainability. 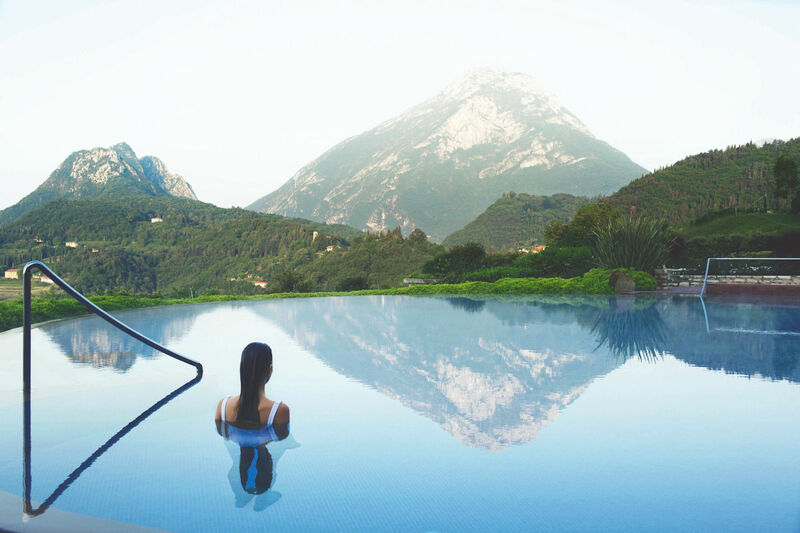 Lefay Resort & Spa, overlooks the glassy waters of Italy’s Lake Garda with snow peaked mountains as your backdrop. This luxurious retreat prides itself on its renewable energy and its ability to simply merge in with the hillside, truly hiding you away from your daily stresses. As a member of Small Luxury Hotels of the World, quality and service are second nature here. 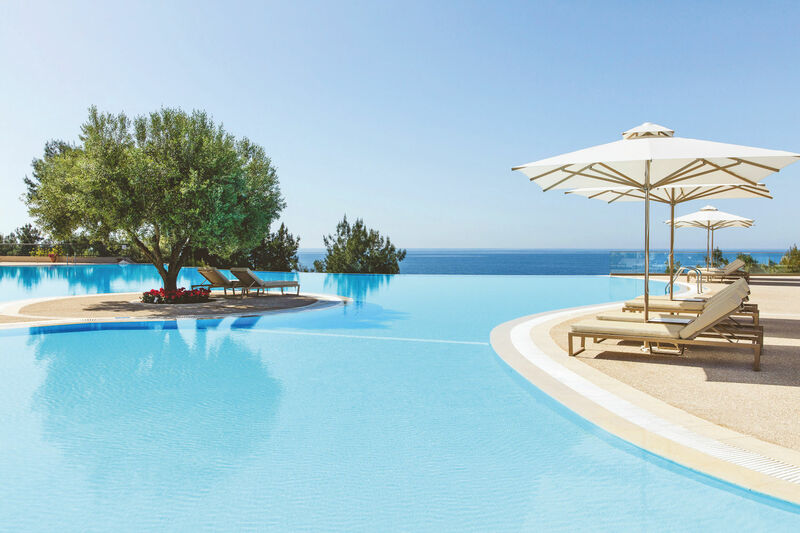 There’s a pool for everyone at Ikos Oceania; this ultra all inclusive hotel boasts a pool for adults, children, toddlers, heated pools, private pools and its show-stopping infinity edge pool. The lagoon style pool utilises architectural lines as if it were painted in to its surrounding. Additionally, in true Ikos style, each pool comes with added extras including sunbeds, towels and attentive service, all free of charge. 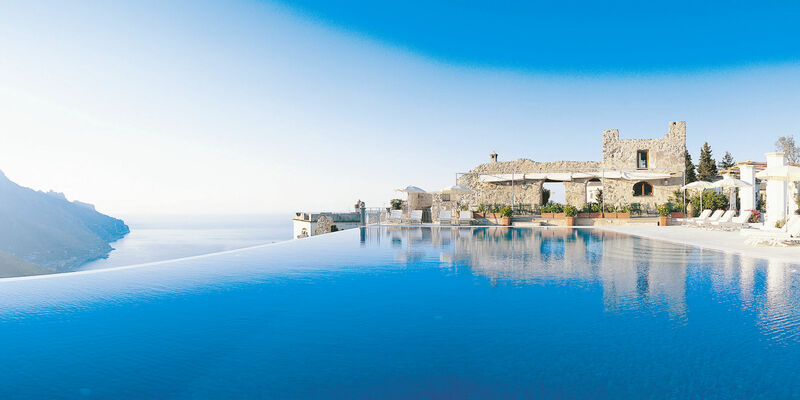 Sublime ocean views, designer looks and Greek sunsets make this infinity pool truly special. 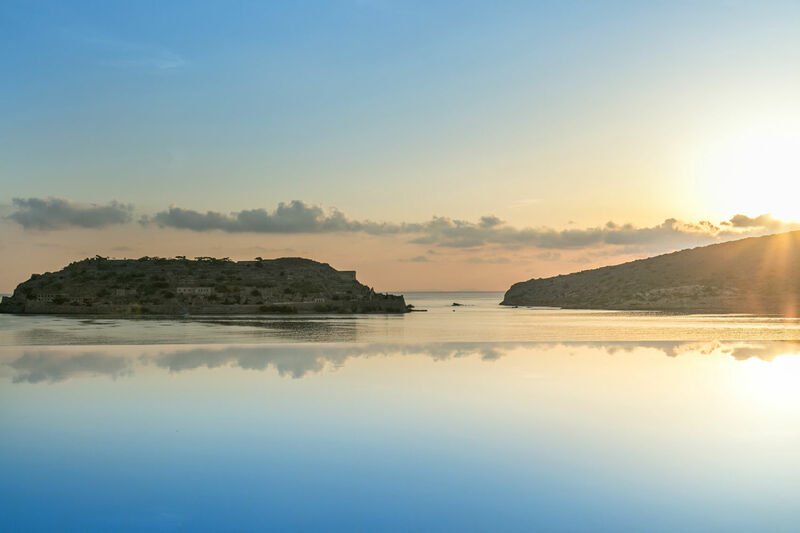 Another small yet mighty infinity pool is at the exclusive boutique hotel Lindos Blu Hotel & Suites. This adult only retreat is built in to the hillside in true Greek amphitheatre style, meaning panoramic views of the glorious Vlicha Bay can be enjoyed throughout. When perched on the edge of this pool, views of the coastline and horizon beyond imprint an inspiring picture on your memory you’ll never forget. As a member of Small Luxury Hotels of the World, design, service and exclusivity are at the forefront of everything they do. When imaging a magnificent view, no doubt you’re picturing towering mountains and winding lakes stretching out as far as the eye can see. Generally, a view like this leaves you speechless with just the faint sound of ‘wow’ escaping. Views here at Switzerland’s Kurhaus Cademario are just that. 850 metres above sea level this hotel is a place of romance, wellbeing and relaxation. All this beauty can be admired from the rejuvenating waters of the hotel’s swimming pool.